Just as hot coals may continue to burn and glow long after the initial fire has gone out, I continue to process the wealth of learning that left with me when I said goodbye to my new friends of the Reggio PLC. I left off my last post with the following words: "What followed (our introduction and tour of Acorn School) was both familiar and new, an invitation to explore the local natural spaces with the group and to gather materials for later exploration. It is a story for another post". Traces of fall diffuse the light and cast intricate shadows on Acorn's floor. As we headed out for a walk together, we were invited to take along a small brown paper gift bag, a clipboard and/or our own digital device. 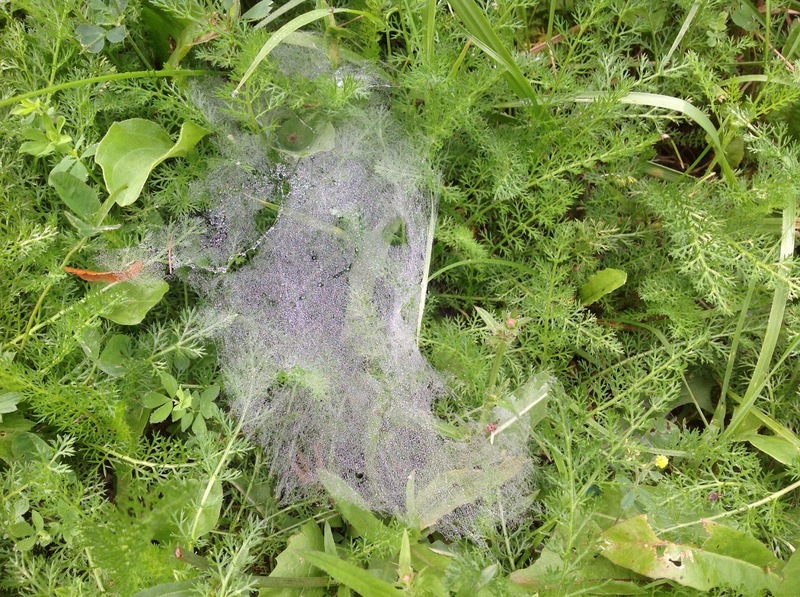 We were off to see and gather anything that captured our fancy, while being cognizant of the life we might impact (something to revisit often with students while outside, or even in when insects visit). One thing that made our walk all the more delightful was that our school hosts joined us for the first part of our walk, with the group of young campers at the school that day. There is a lovely path through the woods beside Acorn School which meanders along, crossing a stream and then up a stone-lined curve to end at a neighbourhood street. 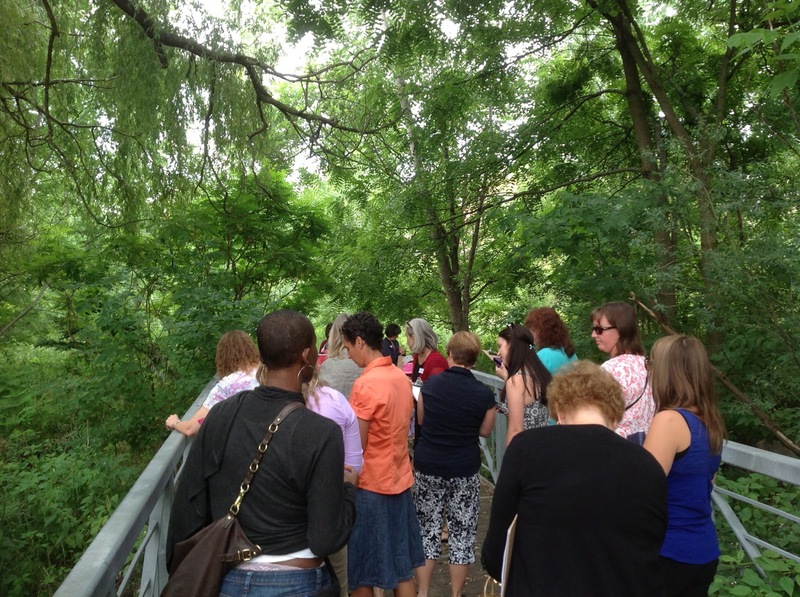 As we walked, our pace was set by the fact that we were adult learners and thus able to set our own pace. Some kept pace with the campers, watching and listening in on their wonderings and observations. Some of us dawdled, finding interesting flora and fauna in the nearby gardens, and listening to the birds overhead. This leads me to the reason I love this introductory activity, and why I think our facilitators Louise and Diane set this learning invitation up so brilliantly. We learners, kids and adults alike, were setting off on an adventure. We didn't know exactly what we would see (you never do, when flora and fauna are involved) but we knew we would be gathering artifacts to share and investigate further, later. This was an invitation to look, listen, and use all available senses to experience summer under cover of trees. But it was also much more, from the perspective of the teacher as learner. For what can you learn on a walk? The campers, ahead out of sight, and many of us adults, watching and listening to the river below us. I stopped a while on the bridge, watching the water bubble against the rocks and swirl in little eddies against the edge. 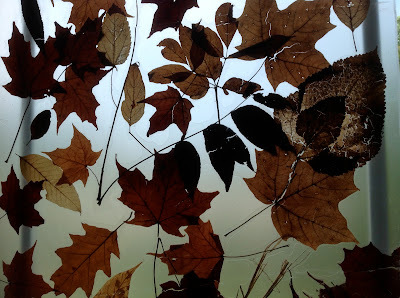 A few boys were watching the same spot, dropping leaves into the curling eddy below us. The leaves kept getting caught there, unable to escape the swirling pool to continue downstream. I was fascinated by their attempts to launch the leaves further, to touch down past the "stuck" spot where the faster water would sweep them away. I didn't talk to them at first, only watched and listened. I could see them trying new strategies and different shaped leaves. I tried my hand at tossing a few leaves as well, and found it difficult to affect the drop. There were many of us on the bridge at the time, and the sounds were quite noticeable: pounding feet stomping out a rhythm, water against stones, birds calling nearby, voices in conversation, gentle splashes of sticks and stones landing in the stream. I forgot for a moment my teacher role, so immersed was I in the play myself, that I didn't write or otherwise record their conversation. I wish now that I had captured some of what those two boys were saying to each other as they played. That magical moment passed, words undocumented, swept away like the water below. The campers headed back to school, and we continued along the path into a clearing surrounded by many types of trees and tall grasses. Talking, noticing, listening, capturing interesting images: all choices in how we learn. I reflected on this first day and realized that this activity is something I've done with my own classes many times. 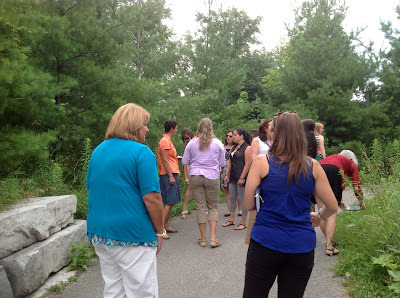 I have also gone on gathering walks with educators, including recently when fellow Reggio-inspired PDSB teacher/blogger Serge Pascucci invited me to bring loose parts nature play to his summer Kindergarten AQ course as a guest presenter. That day in July, our large group took a stroll down the lovely "Philosopher's Walk" at U of T to gather natural materials for later use in collaborative artworks. What struck me, however, is that I hadn't realized to what extent this is a powerful activity for observing learners. With Serge and his class, I was chatting and enjoying the beautiful setting, but also very self-aware in my role as leading a workshop on my own for the first time. In addition to this, I was catching up with someone I had known at a distance for some time (through following his blog, through social media, presenting at the same PDSB Kindergarten conferences, and through sharing pieces of a collaborative inquiry project between our classes in May), but had never met in person. With my students, this activity has always been done far enough into the year that I have gathered signed permission to leave the immediate school grounds for each student. Later in the year means I have already observed each child in a variety of classroom and yard settings. I know them, at least a little bit. I spell this out, because I think it's partly key to why I hadn't noticed how much you can learn about children by giving them freedom, space, and time outside. 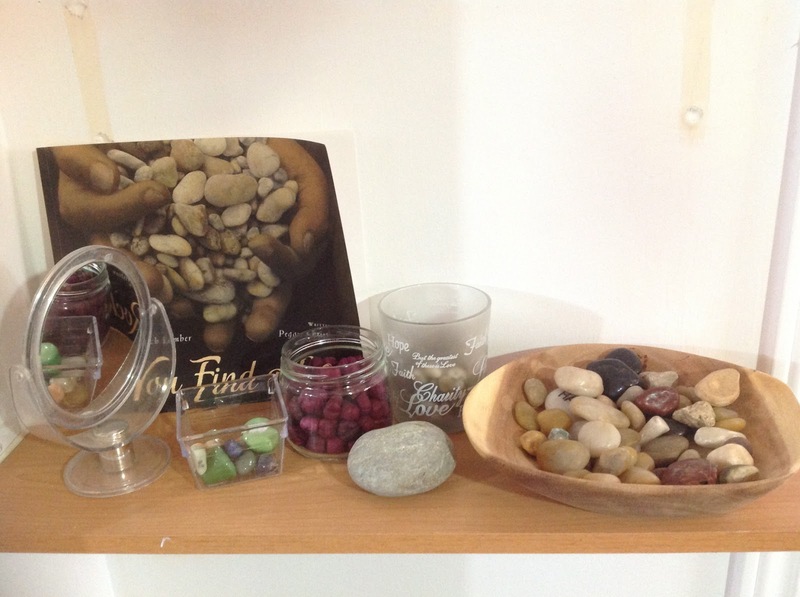 Mostly, though, there is something to be said for the manner in which Diane and Louise presented the big ideas of the Introductory Course to Reggio Inspired Practice. 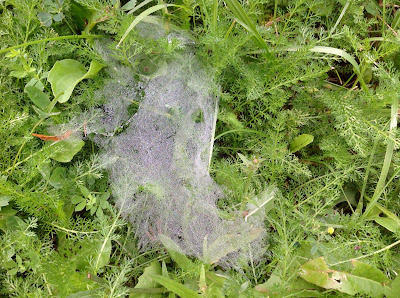 A particularly beautiful moment in time: mist, spiderweb, delicate fern-like plants, shades of green. Others missed it, surprised by the photo later. Likewise, I saw images in others' collections and marveled at what I'd missed. As I outlined in the previous two posts, there was so much time and space afforded us learners to follow our interests. We weren't immediately sat down with a slide presentation about the beautiful schools and wonderful pedagogical insights from Reggio Emilia, nor were we made to feel as though we were in a heirarchical relationship to the teachers in which we had to listen and learn from their wisdom, though they both have much wisdom and knowledge to share. This was something new, for me. I have to admit, I love professional development to the extent that I was a bit broken-hearted when my Kindergarten Specialist AQ came to an end. Collaborating with others, especially those passionate about learning through play, is very rewarding. My instructors and friends from that class remain extremely important in my journey to embrace emergent curriculum. But I had never experienced anything like this, loose in time structure but incredibly rich in materials and experiences. We were honoured as capable learners, invited to participate in the 'uncovering' of the ideas together. We were immersed in delightful activities, and often directed to notice and share when some particular spark caught their eye. Even then, not every participant took part in every learning story, as we were free to rush off or dawdle as our fascination dictated. There was no one "take-away" we all had to leave with, unless it was the post-modern idea that there is never one simple truth, one must-learn lesson from an experience, always multiple perspectives. My lasting impression is that our own self-regulation was a perfect model of how students thrive in our classes. The image of the child in Reggio Emilia schools... brought to life in our adult community. When I go back into my classroom in a few weeks, I will bring this lesson with me. While exploring outside, students are much freer to show their true selves. They don't have to sit close together and keep their voices down, like at a meeting time in the classroom. They don't have to keep curious hands and feet stifled, but instead may step where they wish and touch what they wish, with safety in mind. An observant educator will see many aspects of a child's personality while they explore outdoors: are they fearful of bugs? Do they stomp on ants or gently step around them? Do they point out interesting items to friends or simply watch on their own? Are they calm? Excited? Do they have good balance and spacial sense, or do they trip over obstacles and tumble off of logs? Do they need to share what they see with you, or are they happier to explore silently? Are they interested in water, or trees, or birds, or patterns of light and shade? Are they boisterous and in a hurry? Are they able to transition back to school? The list could go on indefinitely. These are all possible to notice when taking a walk with children. Now imagine you add a degree of difficulty and/or interest to the walk, such as strong wind, rain, cold, heat. Think of how the self-regulatory skills and needs of students might be observed in these different conditions. These are the thoughts that came to me, looking over our photos, and thinking of my own children when we spend time outdoors. Tapping into such experiences allows students to access their prior knowledge (puddles, without rain boots, means wet feet!) while also adding new noticings (grasshoppers fly!). Collecting artifacts, such as we did with our little gift bags, allows for revisiting the experiences and seeing the items in a new light, when invited to use them for sharing or creating. Sharing the collections, talking about what one gathered and why, is another way to honour students' ideas and encourage them to use more of "the hundred languages" of children. That is what we did, our PLC group, after lunch together at Richland Academy. Another day, that story. 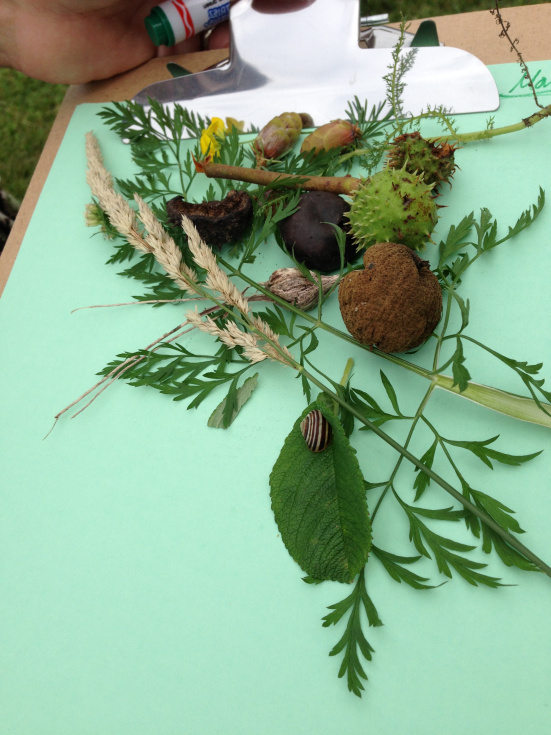 Note: if you are one of the participants from the week, I would love to know what your main "aha's" were after this first day of our Reggio Inspired Practice course.